The Couchbase Plug-in for Elasticsearch enables you to provide full-text search in your application using the open source search engine, Elasticsearch. This means that your users can retrieve application documents from Couchbase Server based on text in your documents. For instance if you provide a product catalog, users can find items based on text descriptions of the products. You use Couchbase Server with Elasticsearch to provide quality, rapid full-text search results. The data model for Elasticsearch is already very compatible with the schema-free, document-oriented model used by Couchbase Server. Since search is often a more CPU-intensive process, you can scale your Elasticsearch cluster separately from your Couchbase cluster to best meet the demands of your users. In doing so, search functions will not slow the performance of Couchbase Server reads or writes. Couchbase Server Manual : covers installation, operations, monitoring, views, xdcr, tools, and trouble-shooting for the server. Elasticsearch : the definitive site for downloads, documentation, blogs and tutorials on Elasticsearch. Couchbase SDKs : describes installation and use of Couchbase SDKs from your web application. Provides Real-Time Replication. The plug-in continuously transfers data to the search cluster after Couchbase Server writes the data to disk; it will help keep your search index on Elasticsearch current with the information in Couchbase Server. Topology Aware. Using the plug-in, the system can handle node failures within a Couchbase cluster or Elasticsearch cluster and adapt accordingly. Replication from a Couchbase cluster will continue from functioning nodes and the items will be sent to available servers in the Elasticsearch cluster. Recovery from Network Failure. The plug-in is aware of what data has already been replicated from Couchbase what data still needs to be replicated. If a network failure interrupts data transfer from a Couchbase cluster, once the network issue has been resolved, replication can resume for remaining data. Your website or web application interacts with Couchbase Server via a Couchbase SDK. These SDKs are provided in a variety of popular web programming languages and are responsible for establishing a connection with the server and for communicating reads/writes and other functions with the server. As mentioned earlier you can also index and query data from Couchbase Server using views and your Couchbase SDK. To provide full-text search with Couchbase Server you need to have a cluster of Elasticsearch engines, the Couchbase Plug-in for Elasticsearch, and a running Couchbase cluster. After an application writes or updates data in Couchbase Server, the server replicates a copy of that data to the Elasticsearch cluster for indexing. The Elasticsearch cluster will perform indexing based on text content in your data; then via an Elasticsearch client, you send a search query to Elasticsearch via HTTP. Elasticsearch does not keep an entire copy of each item replicated from Couchbase cluster. After Elasticsearch indexes an item it keeps the ID for the item and other metadata, but discards the content to remain efficient. After your application queries Elasticsearch for an item via HTTP, it will send back document IDs which you can use to retrieve the entire document from Couchbase Server. With Elasticsearch you can use text search queries, you can also provide logic and regular expressions to describe search criterion. The rest of this guide will show you how you can implement full text search using Couchbase Server, the Couchbase Plug-in and Elasticsearch. Couchbase Plug-in for Elasticsearch. Be aware that the Couchbase plug-in v1.3.0 is compatible only with Elasticsearch 1.0.1. Couchbase Server requirements. This topic describes supported platforms, hardware requirements, software requirements, and network settings. Couchbase Server installation. Couchbase Server comes with an easy-to-use installer, however you may want further information about platform-specific installation steps. Elasticsearch installation. installation instructions and system prerequisites for Elasticsearch. Be aware that the Couchbase Plug-in 1.3.0 for Elasticsearch is only compatibility with Elasticsearch 1.0.1. See the release notes for Couchbase plug-ins that are compatible with earlier versions of Elasticsearch. For now you probably need only one instance of Couchbase Server running in a cluster and one instance of the Elasticsearch engine. Later as you test your integration under load and deploy your implementation, you will need to add more servers to handle the workload. At this phase, the most important point about the Couchbase Server installation is to make sure that you include the beer-sample data, which is available as an installation option. The examples in this guide build on data contained in the sample database. For more information about using sample buckets, see Couchbase Web Console, Installing Sample Buckets. To enable full-text search of data in Couchbase, you transmit data from a Couchbase cluster to an Elasticsearch cluster where it will be indexed by Elasticsearch. The Couchbase Plug-in for Elasticsearch helps transmit data from Couchbase using a protocol understood by Elasticsearch. The plug-in ensures that information from Couchbase can be mapped and converted into data which Elasticsearch will index and query. Install the Couchbase Plug-in. Replace the version number with the appropriate one. Elasticsearch will start and run on your machine in the background. At this point you have the Couchbase Plug-in for Elasticsearch and the Elasticsearch engine installed and running. You can now set up the index templates for Elasticsearch and set up Couchbase Server to send data to Elasticsearch. After installation you are now ready to transfer data from Couchbase Server to Elasticsearch and begin indexing the data. In Elasticsearch you will create an index template to define the scope of indexing and searching. In Couchbase Server, you will change the default setting for replication so that the timing and performance will work with Elasticsearch clusters. Stop and restart Elasticsearch for your changes to take effect. One of the issues that can occur when an Elasticsearch node is overwhelmed by replication from Couchbase is that the node can fail. If this does occur, you may also experience errors from remaining nodes. For more information about this XDCR parameter, see Couchbase Server Manual, Changing Internal XDCR Settings. Open Couchbase Web Console and login. This is the administrative user interface for Couchbase Server. For more information, see Couchbase Server Manual. Click on the XDCR tab. Under this tab you can configure and start data replication between a source and destination cluster. In this case our source cluster is a Couchbase cluster and the destination is Elasticsearch. Click on Create Cluster Reference. A panel will appear where you can specify information for your Elasticsearch cluster. This is the Elasticsearch cluster where Couchbase Server will send copies of documents from a databucket to be indexed. Enter a name, hostname, username and password for your Elasticsesarch cluster then click Save. Be aware that Elasticsearch will be listening on port 9091 which is not a standard port for those familiar with Couchbase Server. 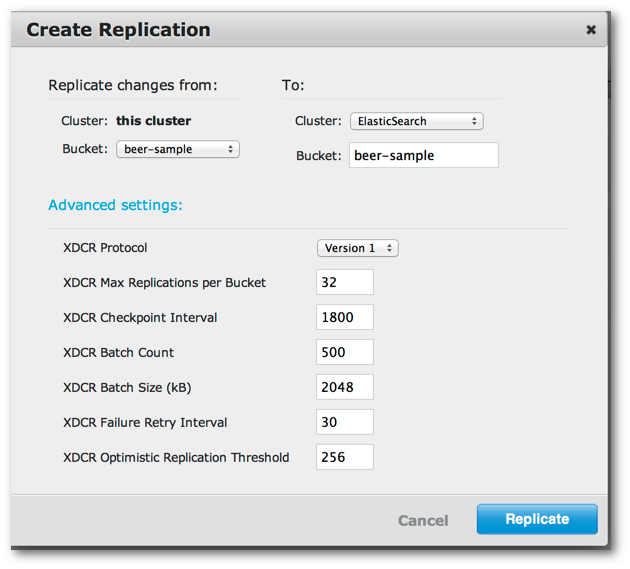 The reference to the new replication will appear in the Remote Clusters list under the XDCR Tab. To set up replication, click Create Replication. A panel appears where you can establish replication from your Couchbase cluster to Elasticsearch. Under Replicate changes from: Bucket, choose beer-sample. Under the section To: select ElasticSearch. For Bucket: enter beer-sample. This is actually the Elasticsearch index where the data will be sent for indexing. If you are using Couchbase Server 2.2 or later, click Advanced settings and change the XDCR Protocol setting to Version 1. Finally click Replicate to start replication of documents to Elasticsearch. Couchbase Server will begin sending data from the beer-sample bucket to your Elasticsearch cluster. Under the Ongoing Replications section, you will see the replication and status of replication. The docs field indicates the number of items that have been indexed by Elasticsearch. At this point you can begin querying data from Elasticsearch. Note that the number of documents displayed by Elasticsearch head may be greater than the actual number of documents in Couchbase Server. This is because XDCR and the Couchbase Plug-in for Elasticsearch will also send additional documents that describe the status of replication and Elasticsearch head will show this total number. There is an alternate, more accurate way you can determine the true number of documents indexed by Elasticsearch, which excludes extra status documents. You can use this method to debug possible data transfer issues between Couchbase and Elasticsearch. For more information, see Monitoring and Troubleshooting, Compare Document Count. Copy one of the document IDs returned by Elasticsearch, for instance dark_horse_brewing_co-tres_blueberry_stout. Click on the Data Bucket tab in Couchbase Web Console. A table appears with a list of all Couchbase Buckets. Click on the Documents button for the beer-sample bucket. A table appears which displays all documents in the bucket. "query": "style: lambic AND description: blueberry"
Rather than using the web console to retrieve a document, you would typically use a Couchbase SDK to retrieve the documents the IDs. There are specific methods and functions available in each SDK to retrieve one or more items based on the IDs. For more information about reading and writing data from an application with Couchbase SDKs, see Couchbase Developer Guide. For more information about the JSON request and response documents for Elasticsearch, see Elastic Search, Search API. Both Couchbase Server and Elasticsearch enable you to flexibly model data by using JSON documents to represent your application objects. These documents generally contain all the information about a data entity, and can be as complex as you choose. You can use nested data and structures such as arrays and hashes to provide additional information about your object. You also do not need to perform schema migrations for JSON documents. Instead you can flexibly write new data fields or values to represent new information in your documents. Be aware that Elasticsearch automatically creates a mapping which defines what is searchable in your documents. So how you design your documents for search is influenced by Elasticsearch mappings. This guide is not intended to be an exhaustive description on how to model documents for use in Elasticsearch or how to modifying mapping in Elasticsearch. For more information, see Elasticsearch Guide and more specifically Elasticsearch Guide, Mapping. By design, there may be some cases where you do not want to update all your products to have integer SKUs. This may be an intentional design choice if your application logic does not depend on it, or you may want to change your application logic to handle both string and integer SKUs. When you use Elasticsearch, it will generate a default mapping used to index items; this mapping describes how particular fields should be indexed. By default, Elasticsearch builds a mapping based on documents transmitted to it and it will make assumptions and generalizations about all documents based on the initial documents it receives. Each default mapping will assume specific data types for each field. Be aware that even though you can change a field type for a document in Couchbase Server, it can cause problems for Elasticsearch if you do not also update the default mapping. If you change the field type in Couchbase Server, Elasticsearch will not index the new documents containing the different field type and you will not receive the document ID as a search query. In this case, because we change the SKU from a string to an integer, all the products we add to our system with the integer SKU will not be indexed by Elasticsearch using the default mapping. For more information about changing a mapping see Elasticsearch Guide, Mapping. To resolve this, whenever you update a document schema you probably want to update all documents which contain that field. In our example, we update the SKU field so that all documents have integers for SKUs. Elasticsearch will receive all updates to existing products and then index them. For more general information about data modeling for Couchbase Server, see Couchbase Developer Guide, Modeling Data. If you search for a name set to blue and a count greater than 5, you will get this document in your index, even though the count associated with blue is 4 not 6. This is most likely not what you expected since the two conditions are satisfied by two different objects in the array. To handle these types of scenarios, you need to provide your own nested mapping for Elasticsearch. For more information see Elasticsearch Guide, Nested Type. Time to Live, also known as TTL, is the time until a document expires in Couchbase Server. By default, all documents will have a TTL of 0, which indicates the document will be kept indefinitely. When you create your own application, you can provide specific TTLs such as 30 seconds. As part of normal maintenance operations, Couchbase Server will periodically remove all items with expirations that have passed. By default this maintenance process runs every 60 minutes. Be aware that if you use TTLs in Couchbase Server that this expiration will not be propagated with a document to Elasticsearch. Instead Couchbase Server will send information about the document deletion when the maintenance process runs on the 60- minute interval. This may cause some problems because the document ID can appear in an Elasticsearch index, but the document may no longer be available from Couchbase Server. To mitigate this problem, you can manually enable the expiration field used by Elasticsearch, _ttl. When you do this, Couchbase Server can propagate the document TTL to Elasticsearch, and then Elasticsearch will remove the item from an index when TTL expires. Because there is some time lag between the servers during replication, indexing, and maintenance processes, document expiration will not occur at the same exact time for each server. However if you use this approach it can help reduce items in an Elasticsearch result set which are no longer available from Couchbase. To enable this setting, see Elasticsearch Guide, TTL Field. Date Formats: While Elasticsearch enables you represent dates in several different manners, it will be easier to manage your system when you store dates in the same field and use a single date format. For more information about date formats supported by Elasticsearch, see Elasticsearch Guide, Date Formats. Geographic Data: Be aware that Elasticsearch has a limited number of formats for geographic data. For more information see Elasticsearch Guide, Geo Point Type. Data did not get indexed. In Couchbase Web Console under Data Buckets, Click | Bucket-name | Outbound XDCR to view information about data replication via XDCR to Elasticsearch. The statistics in this section will indicate the rate of data transfer between Couchbase Server and Elasticsearch. For more information about monitoring XDCR, see Couchbase Server, Manual, Monitoring Replication. The plug-in logs to the same directory and file that Elasticsearch uses at the root of a Elasticsearch node. For production systems the log is at /var/log/elasticsearch. So the count result is the same number as the number of items from Couchbase Web Console; this provides assurance that all items from Couchbase are transferred and indexed. If you get this error make sure you are using the plug-in with the correct version of Elasticsearch. To resolve this error, check your remote Elasticsearch reference in XDCR and make sure the IP address is correct. If you have an existing Couchbase data bucket with a large number of documents already in production, these documents will be transferred to Elasticsearch in bulk. Typically this works with Elasticsearch default settings, however there are some Elasticsearch settings you can change so that indexing quickly completes. You use the Elasticsearch refresh_interval setting to indicate how frequently the engine provides newly indexed items. During an initial bulk load of documents from Couchbase, you can reduce access to newly indexed items in exchange for overall faster indexing time. For more information about enabling and disabling this setting, see Elasticsearch Guide, Indices Update. When you send documents to Elasticsearch it will automatically generate a mapping that contains rules for indexing fields. You can also provide your own mapping or update this mapping. Be aware that this default mapping from Elasticsearch includes assumptions about data types and data structures in your documents. Based on these assumptions, Elasticsearch may omit your document from the index. For instance, objects within an array may not be indexed as you expect. For more information and potential fixes see Document Design Considerations. For general information about expected data structures for Elasticsearch see Elasticsearch, Mapping, Types and related sections. Validate your documents as well-formed JSON. The Couchbase Plug-in for Elasticsearch will take any items that are binary data and will log an error message. Elastic search cannot index documents which are not valid JSON, for instances.jpgs and other forms of binary data cannot be indexed by Elasticsearch. When any search engine has to index large blocks of data, the process is more CPU intensive than smaller blocks of data. So if you have objects with large amounts of text that are not important for search results, you can provide a custom mapping and omit those fields from indexing using the setting enabled. For more detailed information, see Elastic Search Guide, Object Type. 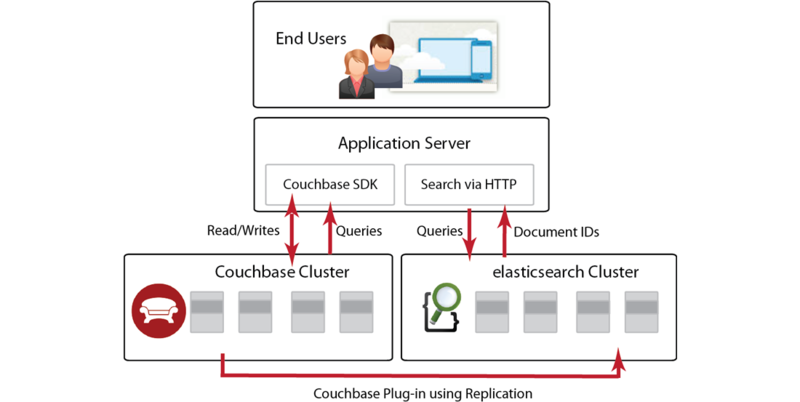 If your Couchbase Server cluster experiences a backlog of items in the replication queue, you may want to consider adding additional Elasticsearch nodes. This should increase how quickly items can be indexed by the search engine. If you are running your Couchbase cluster and Elasticsearch cluster on hardware with high-performance CPUs, you can increase this setting to improve replication speed between the two clusters. In the case of Elasticsearch, there are also scenarios where you may want to decrease this setting from the default so you do not overwhelm an Elasticsearch node. This is discussed below; for more information about this XDCR parameter, see Couchbase Server Manual, Changing Internal XDCR Settings. This means that Couchbase Server cannot communicate with Elasticsearch in the time that it expects. Couchbase Server can recover from these types of errors and retry replication, however your replication may take longer to complete or operate with higher latency because the operations must be later retried. If you encounter this scenario, you should lower the default xdcrMaxConcurrentReps setting to 8 or less so that the total number of concurrent replications can be handled by your Elasticsearch node. For more information on changing this setting, see Couchbase Server Manual, Changing Internal XDCR Settings. couchbase.port: the port the plug-in will listen on. Default is 9091.
couchbase.username: the username for HTTP basic authentication. Default is Administrator. couchbase.password: the password for HTTP basic authentication. No default established. couchbase.checkpointDocumentType: type of document which stores status information about replication. Default is couchbaseCheckpoint. couchbase.num_vbuckets: number of data partitions Elasticsearch should specify to Couchbase Server. Default corresponds to the number of partitions expected by Couchbase Server and that exist on the source Couchbase cluster. For Mac OSX, the value is 64, and for all other platforms it is 1024. Couchbase Plug-in for ElasticSearch on Github. Couchconf Presentation on Full Text Search Integration. The Learning Portal a proof-of-concept application which demonstrates Couchbase and Elasticsearch together. The full source is also available on GitHub at Couchbaselabs, Learning Portal. Blog post and tutorial on Elasticsearch with Couchbase, from Couchbaselabs. Elasticsearch Guide, which is particularly useful for developing more advanced queries, indexing a field more than one way, and to provide custom mappings which influence your search results. This appendix contains release notes for individual versions of Couchbase Plug-in for Elasticsearch. This release is compatibility only with Elasticsearch 1.0.1. Support for new XDCR checkpointing protocol CBES-26. Fixed failure handling due to bounded queue with Elasticsearch 1.x CBES-27. This release adds compatibility with Elasticsearch 0.90.5. This release adds compatibility with Elasticsearch 0.90.2. Fixed data corruption under high load (CBES-11). Fixed recognition of non-JSON documents (CBES-11). This is the beta release of the plug-in.